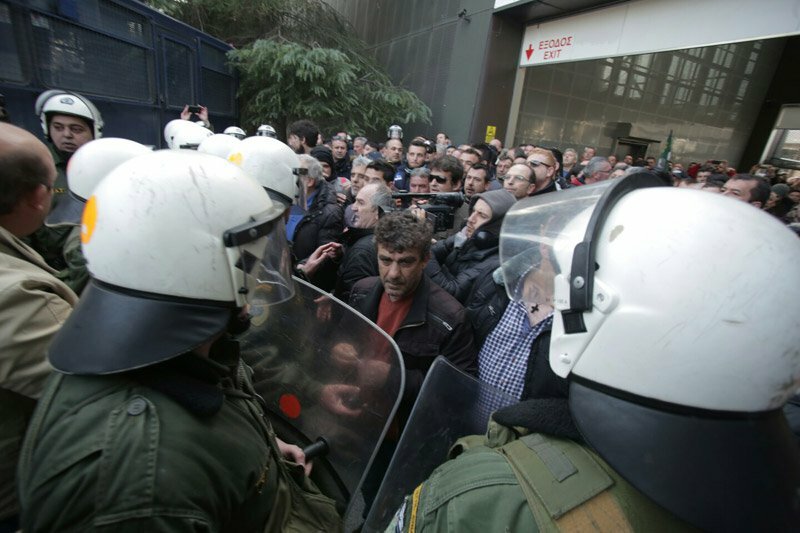 Greek police on Thursday failed to stop protesting farmers who reached with their tractors the entrance of the Thessaloniki International Fair. Dozens of farmers gathered with their vehicles at the YMCA Square in the center of Thessaloniki to demonstrate against the harsh austerity measures implemented as of January 1. In the rally there were farmers from Thessaloniki, Larissa, Karditsa, Drama, Serres, Katerini, Xanthi, Orestiada, Kavala and other central and northern Greece cities. The assembled farmers clashed with riot police a little after 4 p.m., as they tried to break the police cordon and reach the entrance of the TIF. The protesters managed to break the police line and reach their destination.